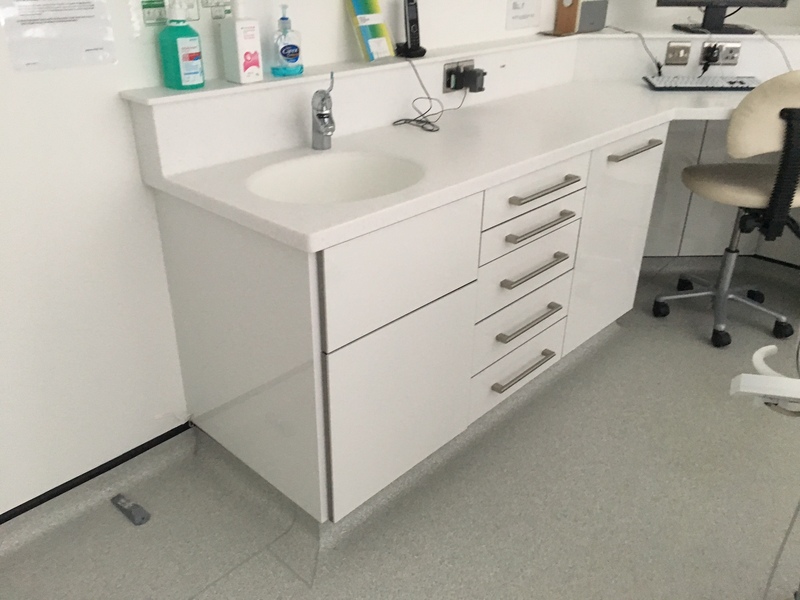 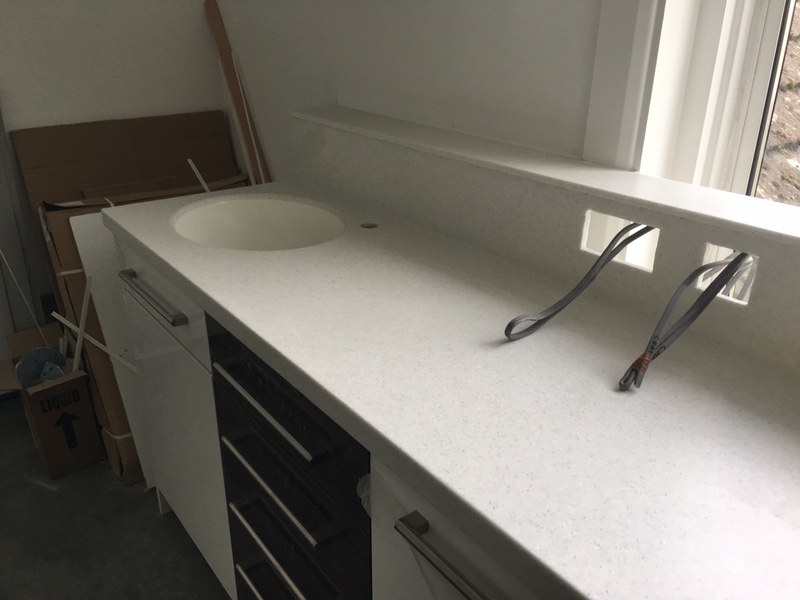 A recent solid surface in Bright White Staron fitted for one of our trade customers. 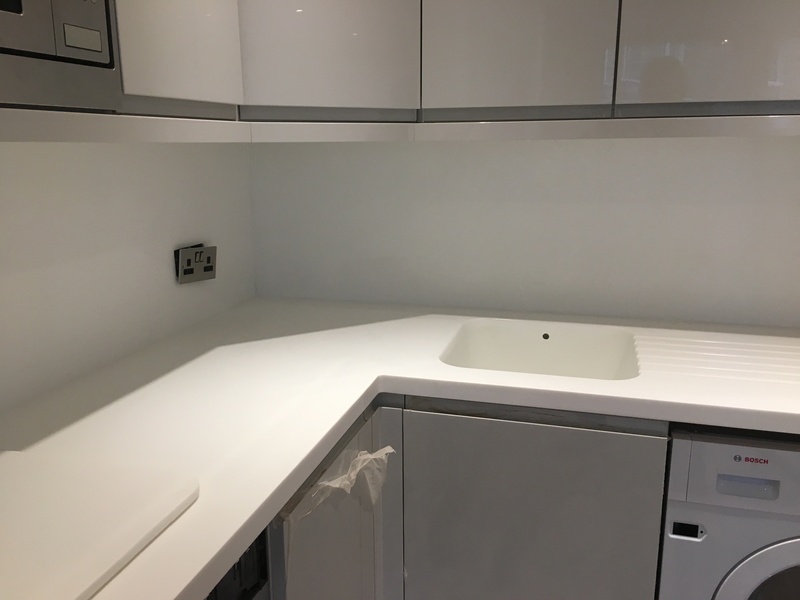 White was our most popular Corian and Staron colour choice last year and we think it’s here to stay for a while longer. 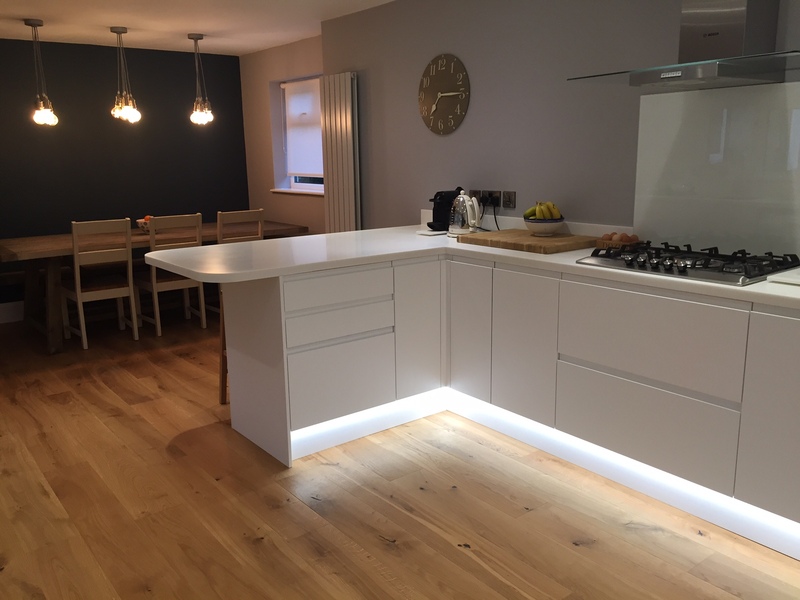 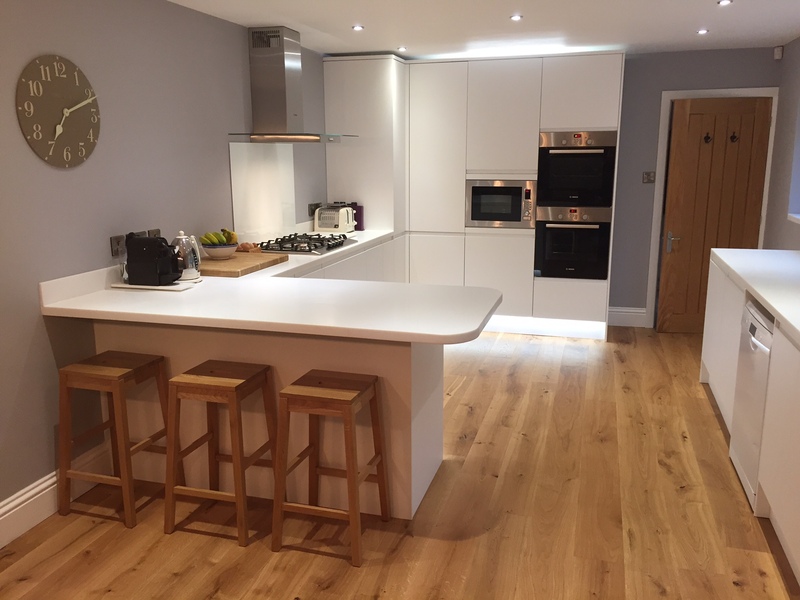 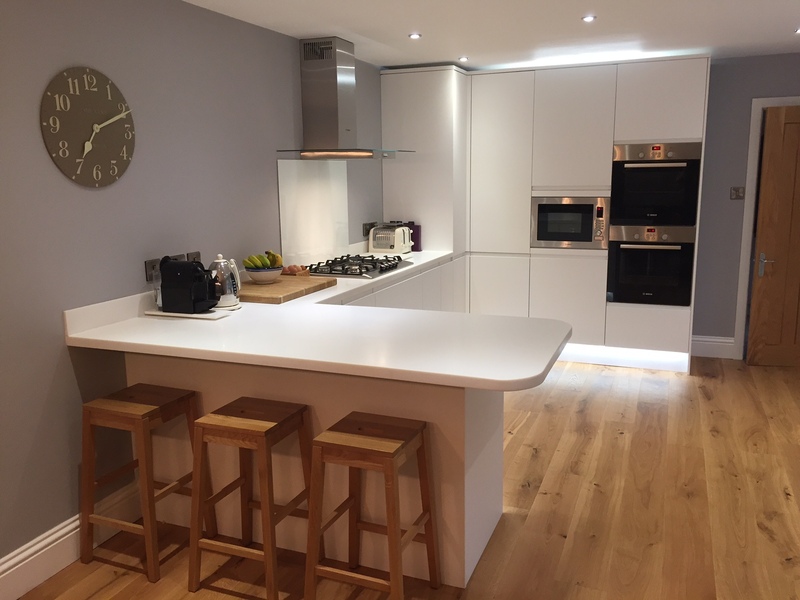 Our customers love the fresh, modern look that white worktops create in their kitchens. 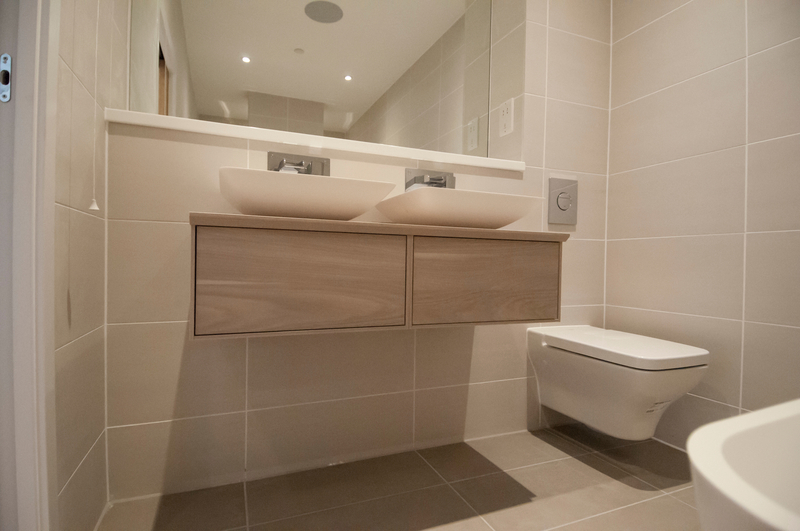 The seamless and clean look it creates is perfect for any modern home. 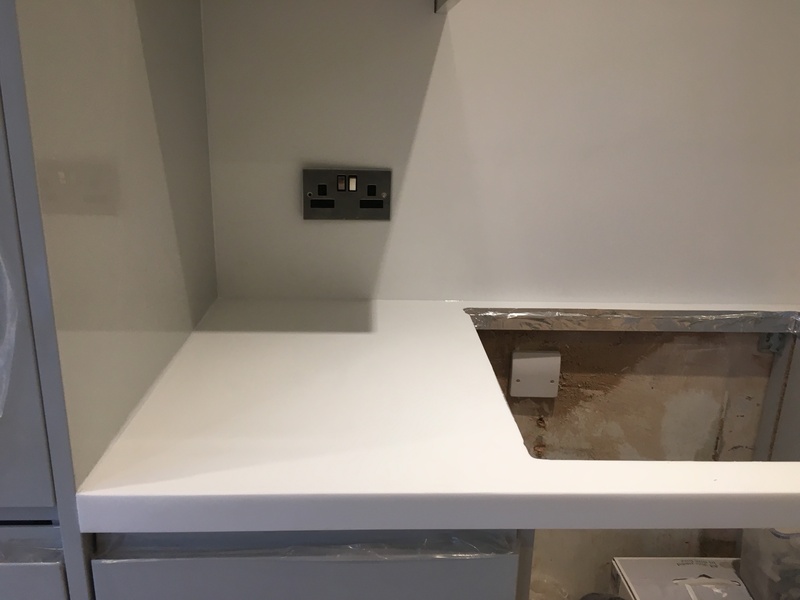 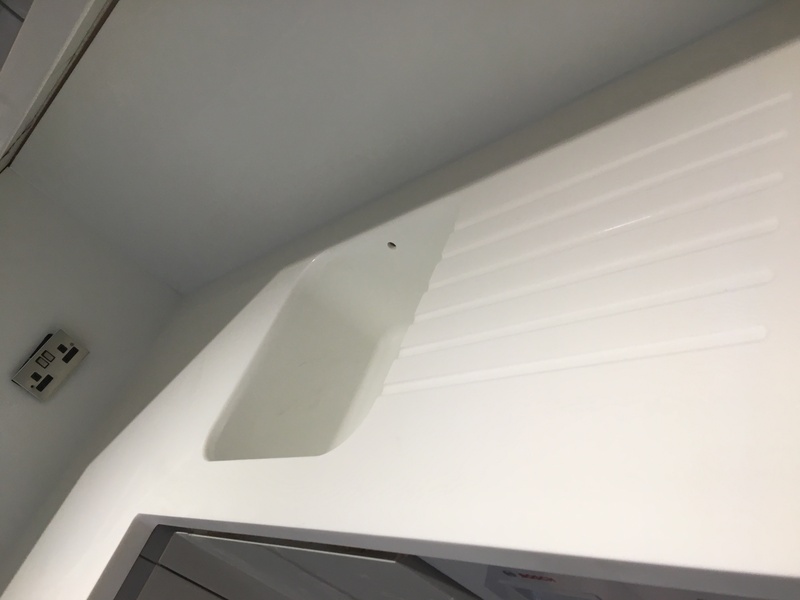 This customer chose to continue the solid surface up the wall as a splash back that ran from from the worktop to the underside of the wall units. 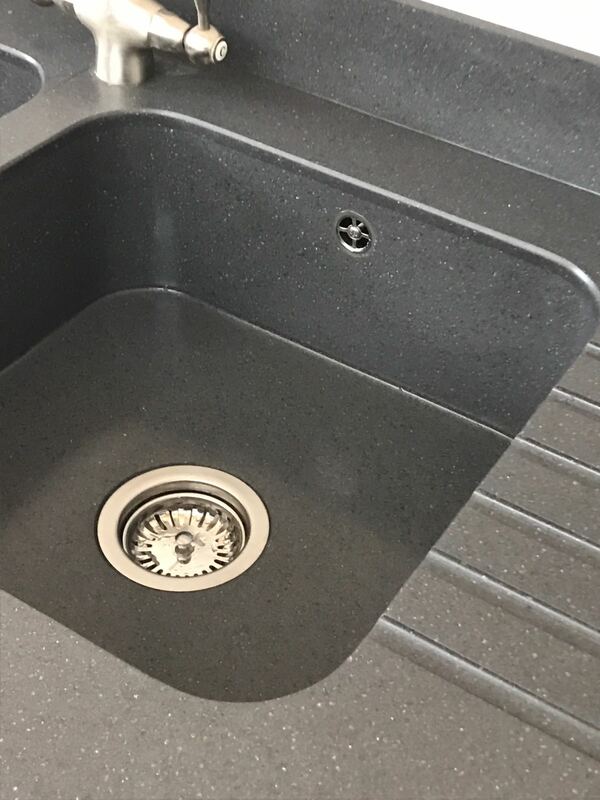 We fabricated an integrated sink and drainer grooves in Staron too. 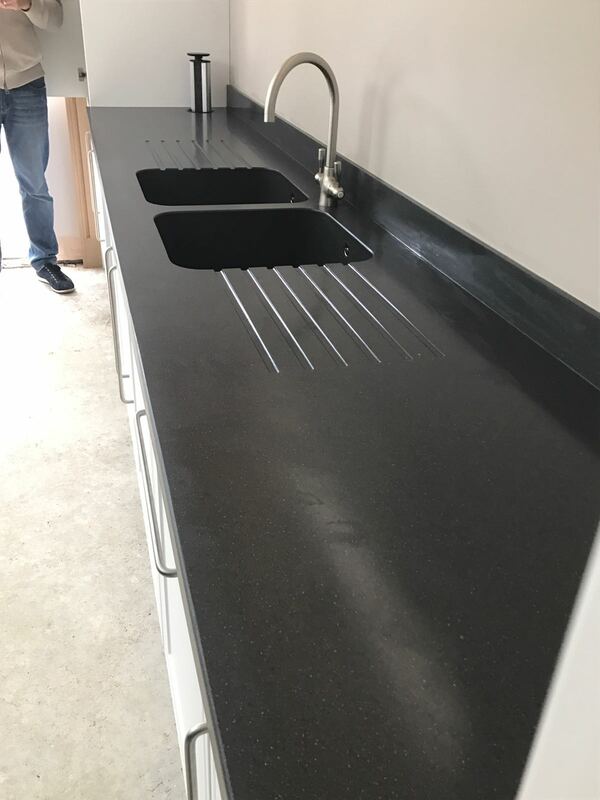 Our client in Milton Keynes chose the Staron colour Meteor, from the Tempest range to complement their sleek, new grey kitchen units. 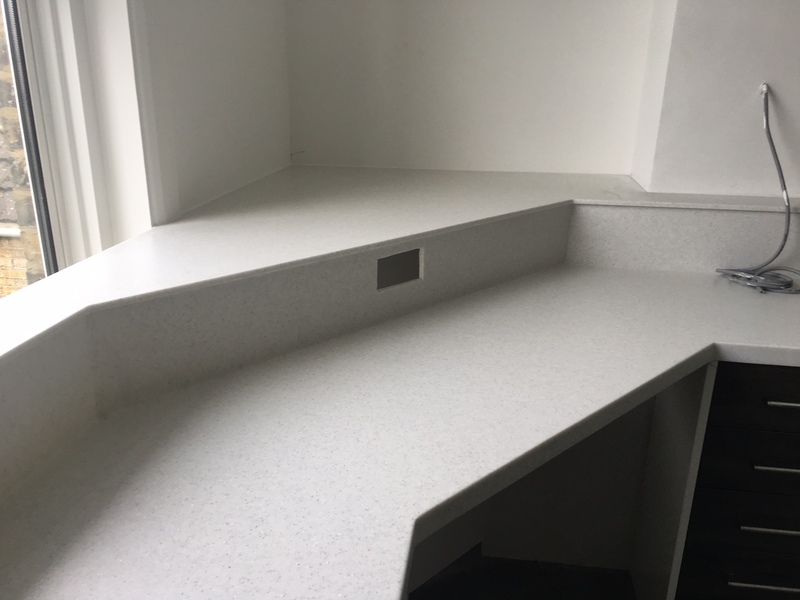 We designed and fabricated an integrated Staron built-in bowl and a half sink with coved upstands. 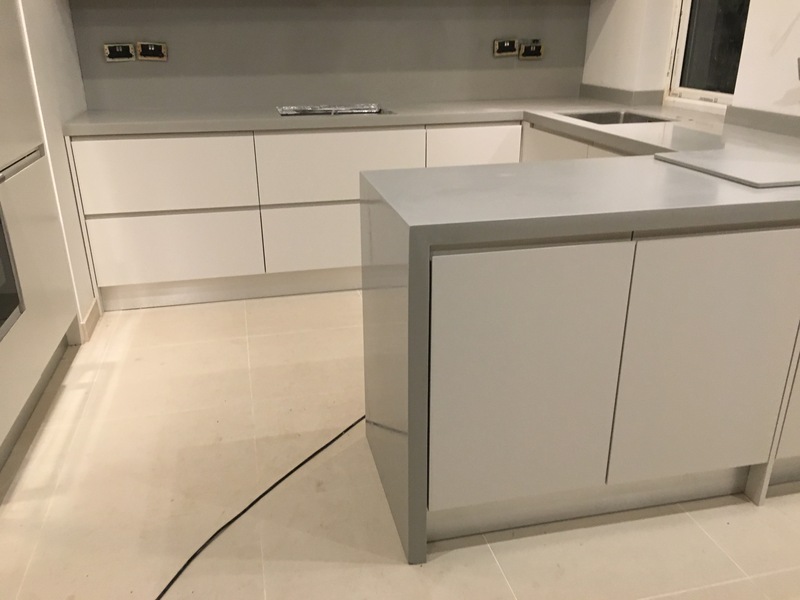 To create a waterfall effect we fabricated seamless kitchen island end panels that reach down to the floor. 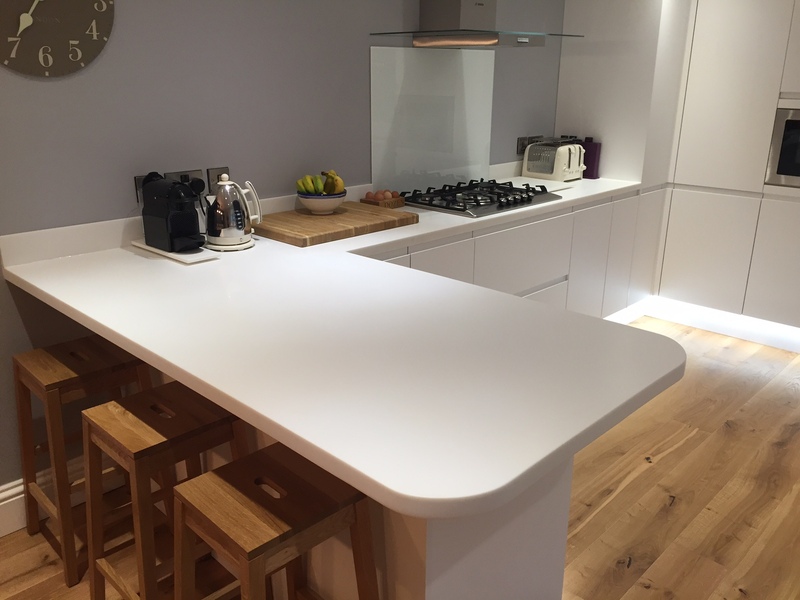 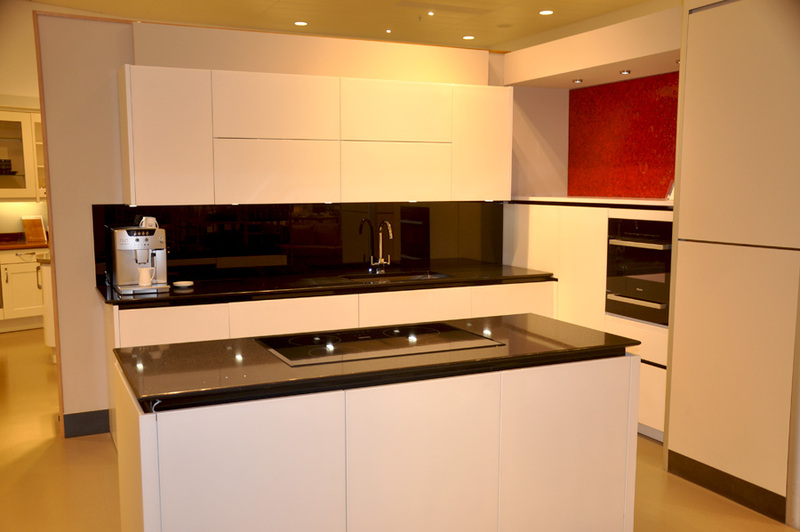 Our Staron solid surfaces come in many colours, please get in touch to find out more. 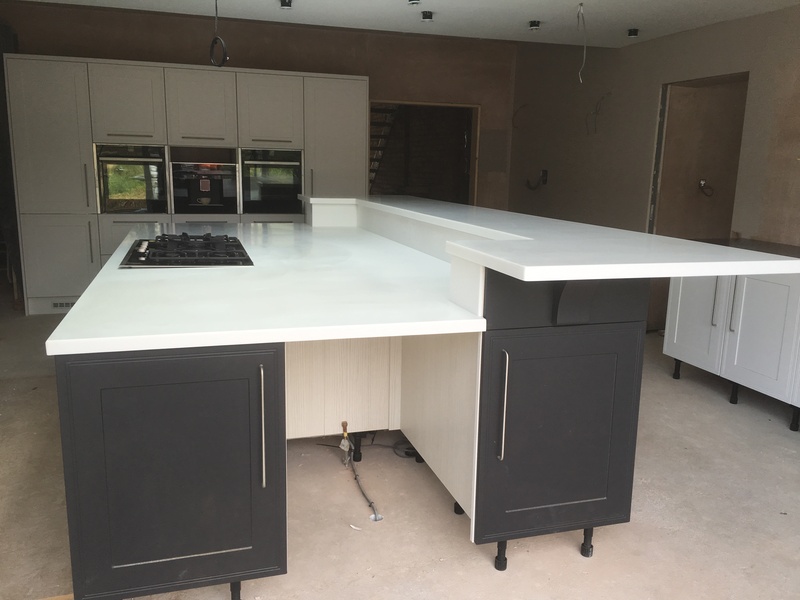 Corian ‘Warm Grey’ – Kitchen Solid Surface with waterfall effect peninsula. 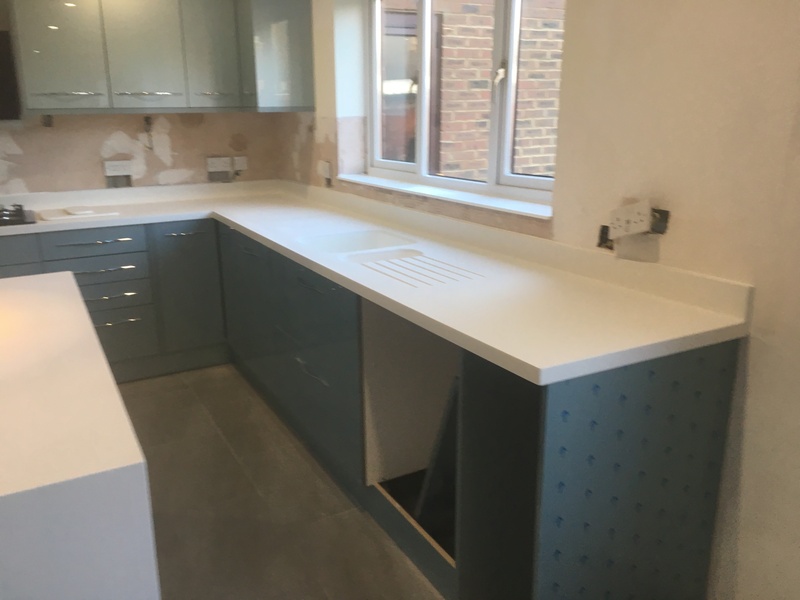 A recent client kitchen surface project in Bromley, Kent. 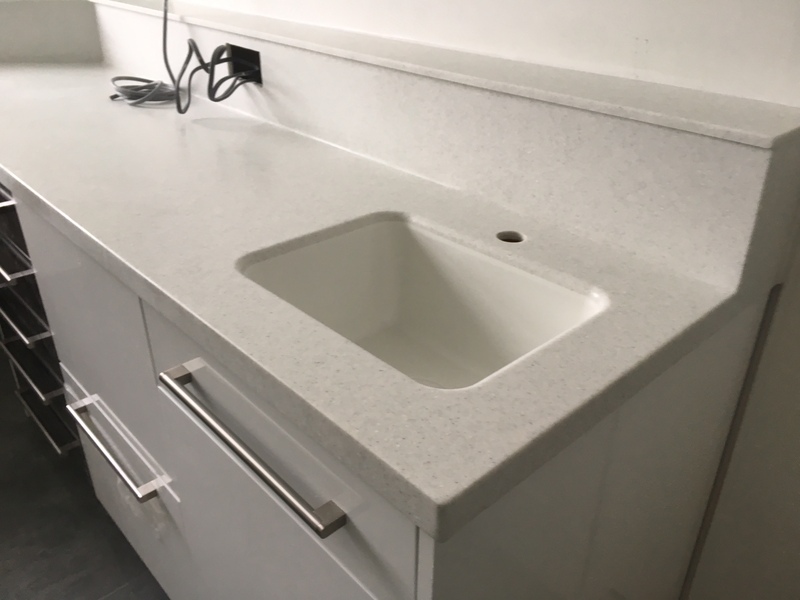 Corian colour is warm grey. 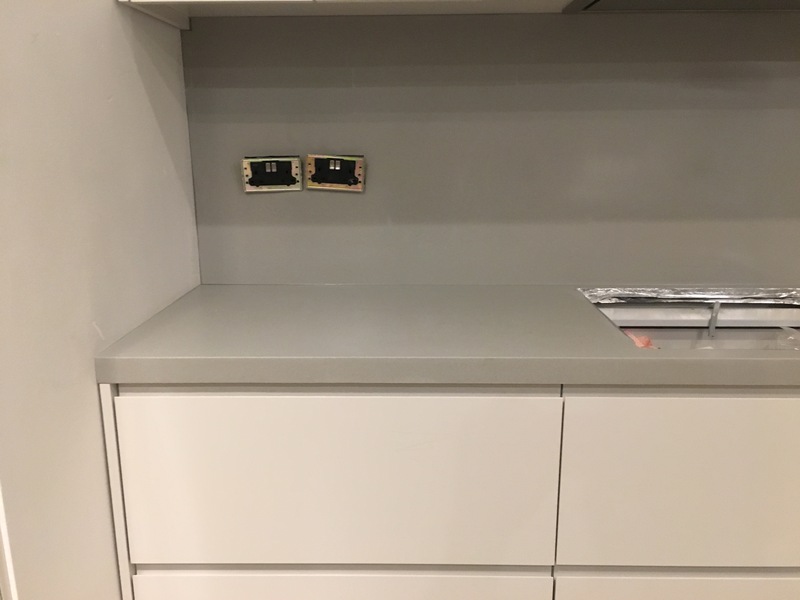 We created a deep splash back that runs from the top of the worktop to the underside of wall units with electric sockets cut in. 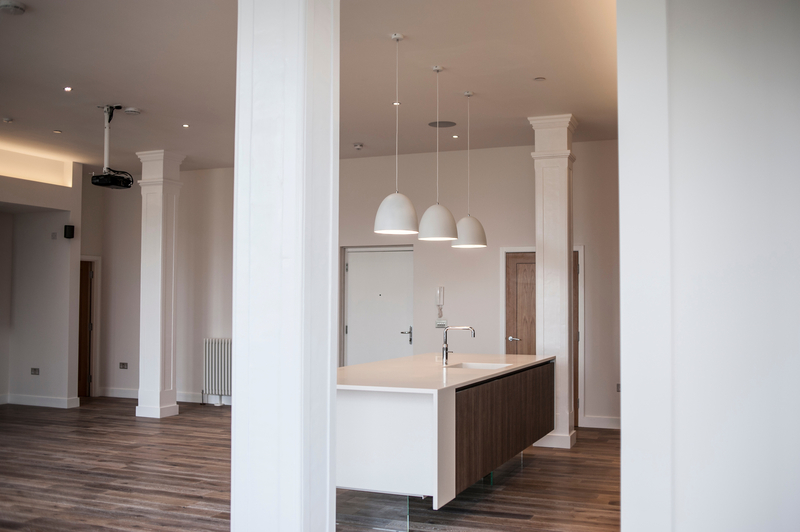 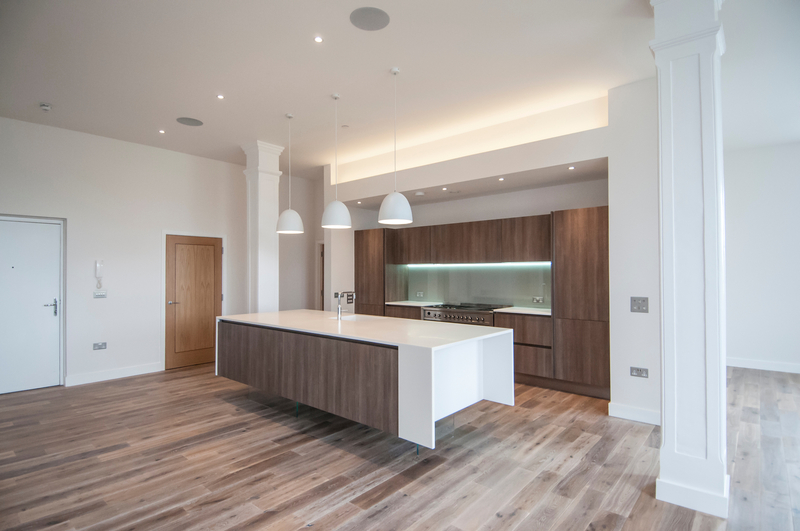 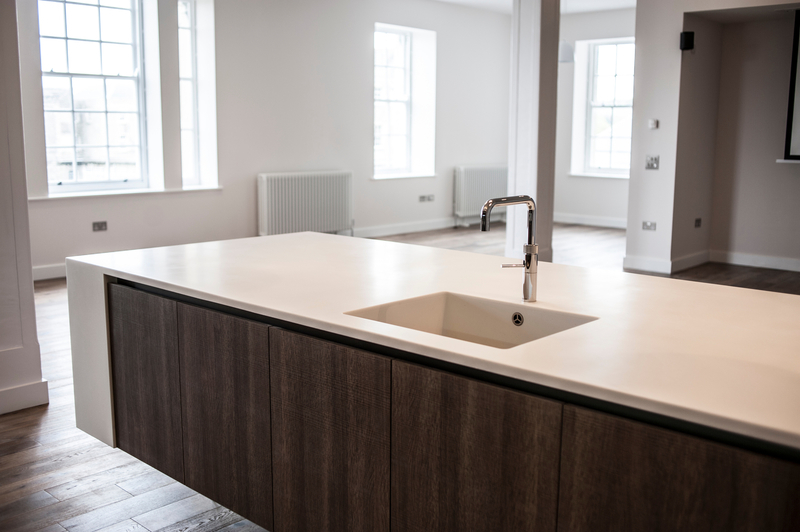 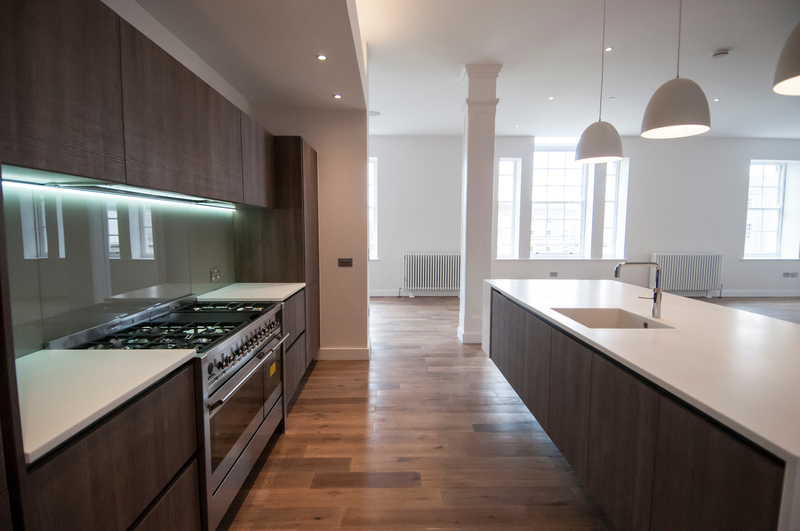 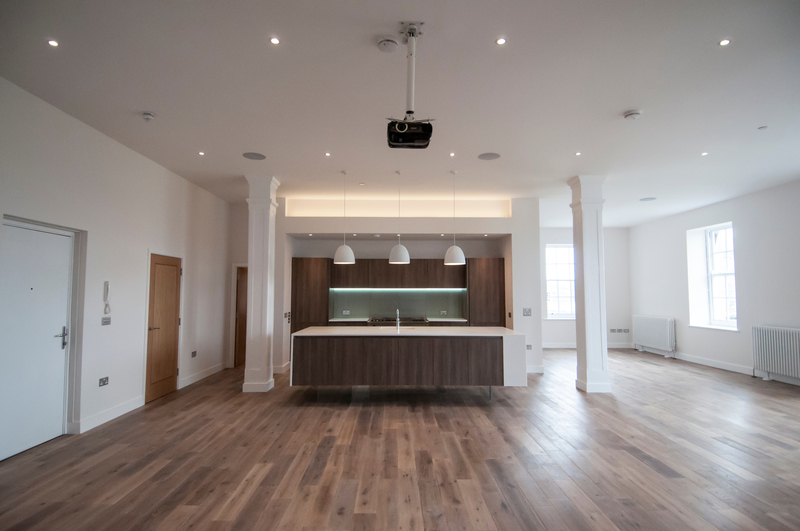 The corian runs into the window to continue a seamless surface and the peninsula end runs right down to the floor, creating a stunning corian waterfall effect. 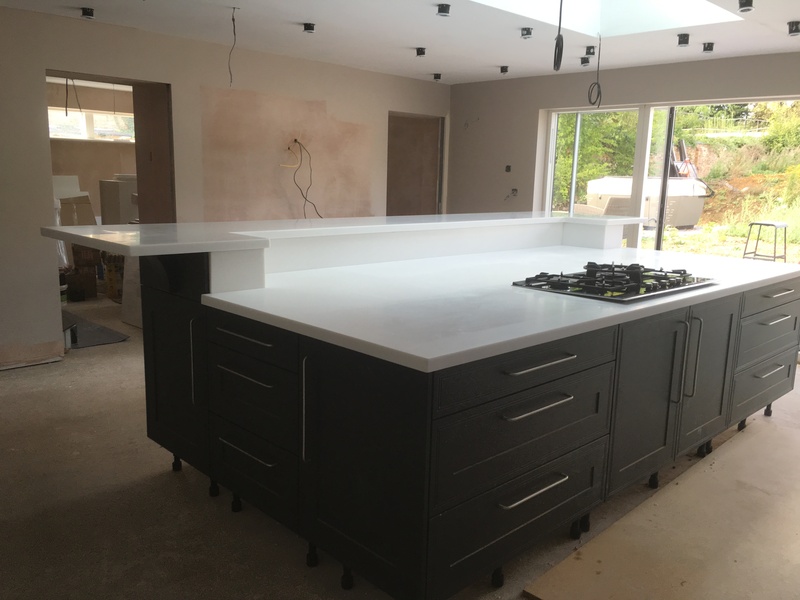 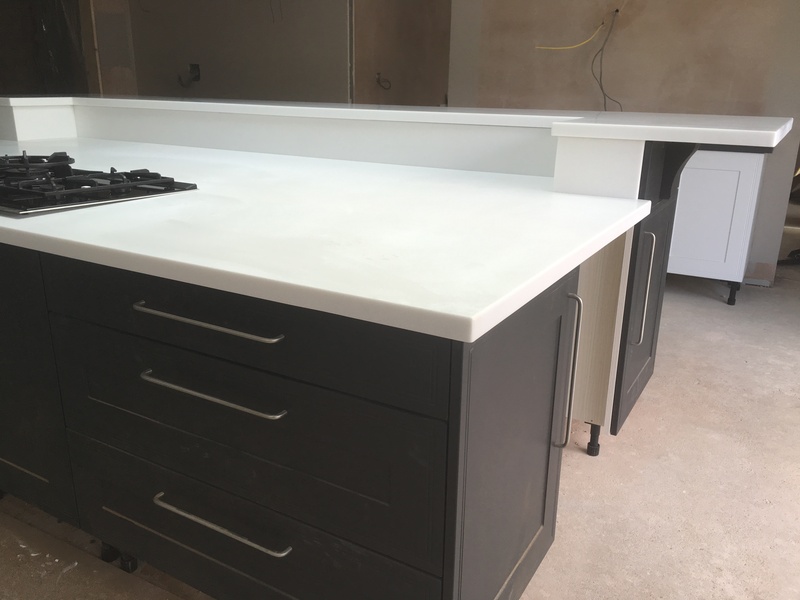 We have just completed a solid surface, kitchen worktop for a client in Lincolnshire. 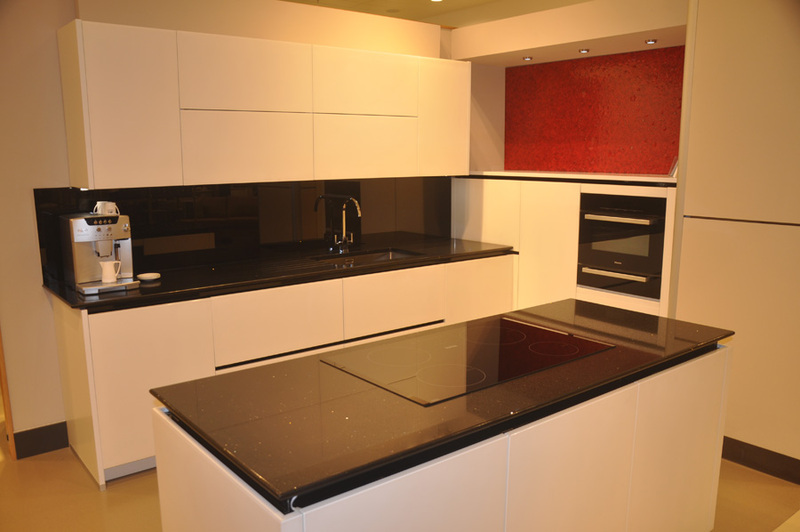 The material is Staron (very similar to corian) and the colour is Quarry Starred. 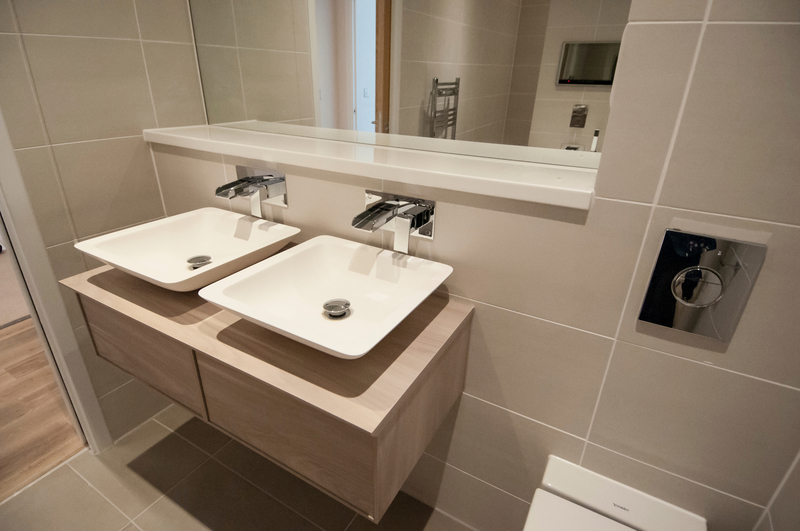 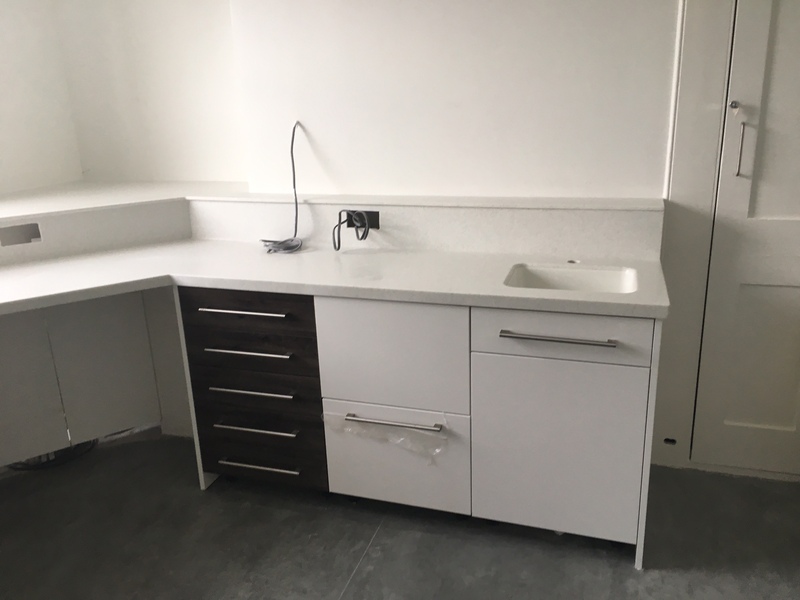 The pictures below show the sink run including an integrated double-sink with drainers both side, a cut-out for an electric point and a low up-stand. 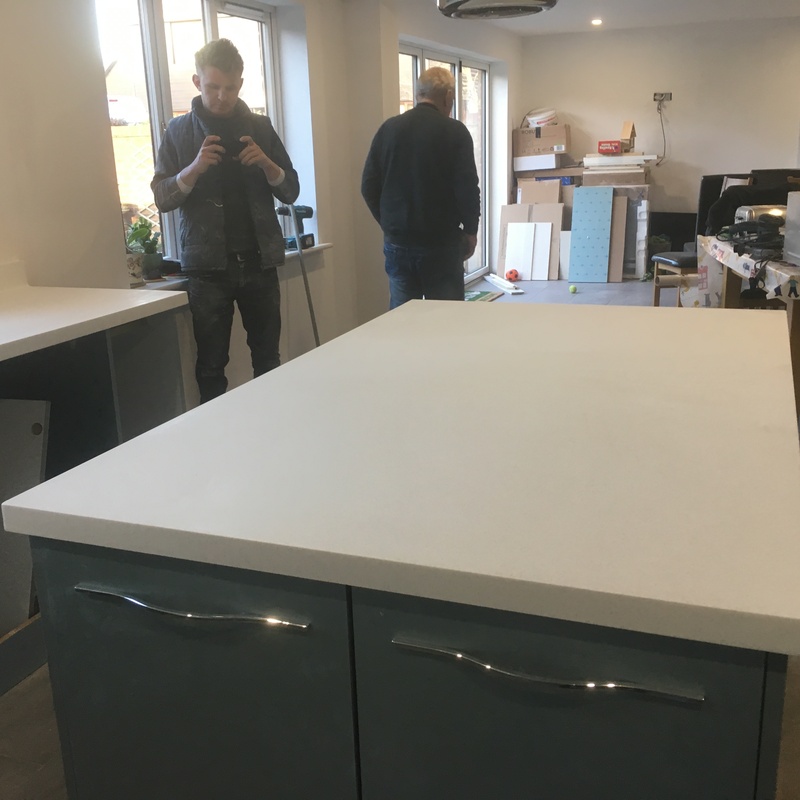 These are work-in-progress photos of a new Staron kitchen worktop and island-breakfast-bar fitted in a large kitchen in Stamford. 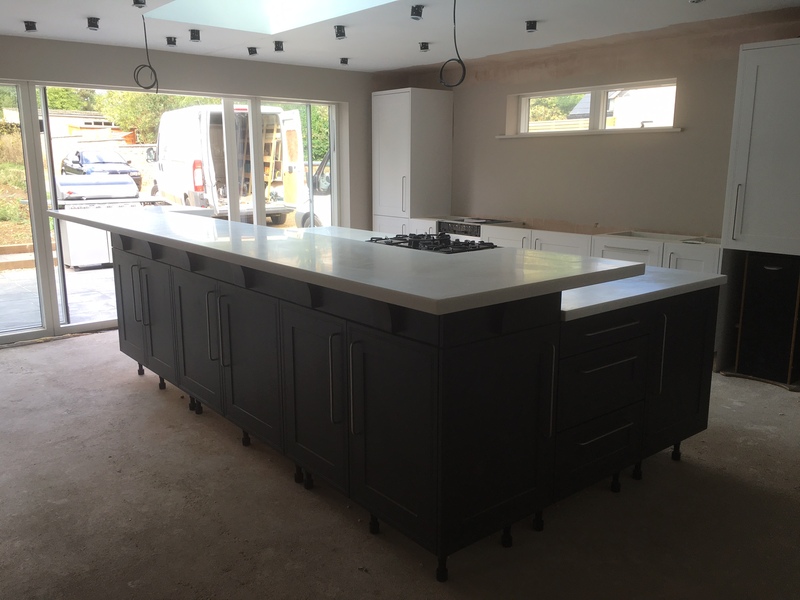 The split level, seamless island into breakfast bar makes a huge impact in the middle of this stunning new kitchen. 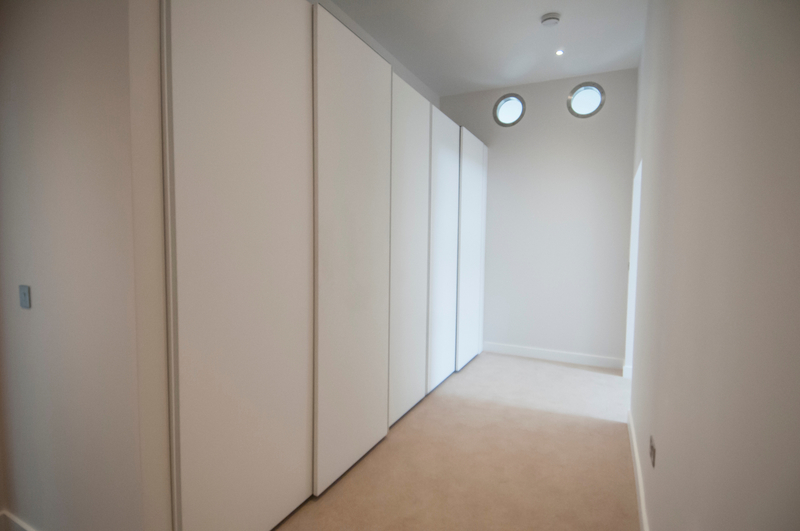 We can’t wait to see the finished room. 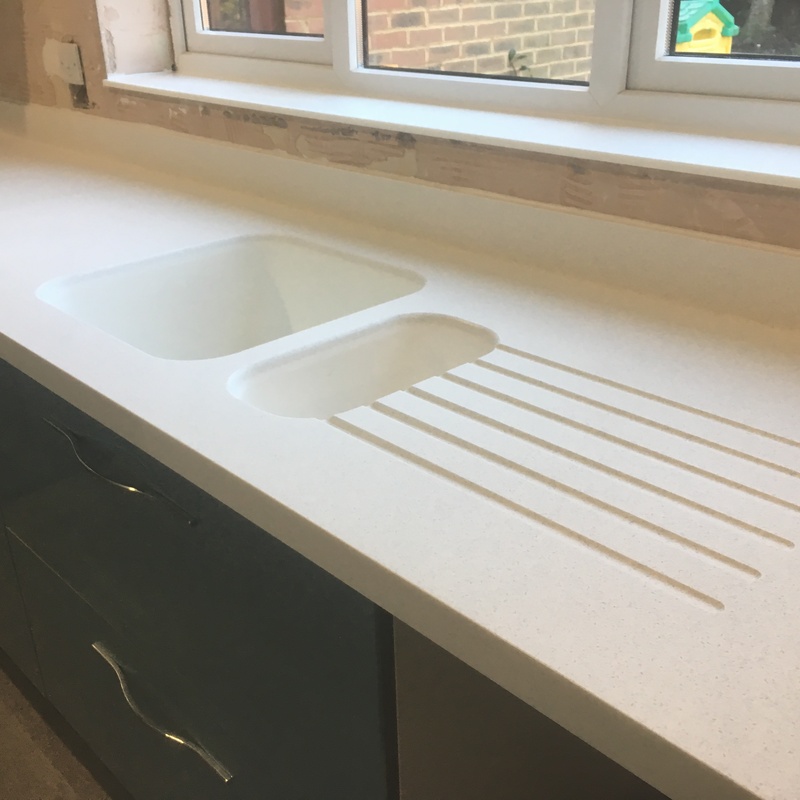 Call us on 0800 7747854 to ask us about our Staron solid worktops. 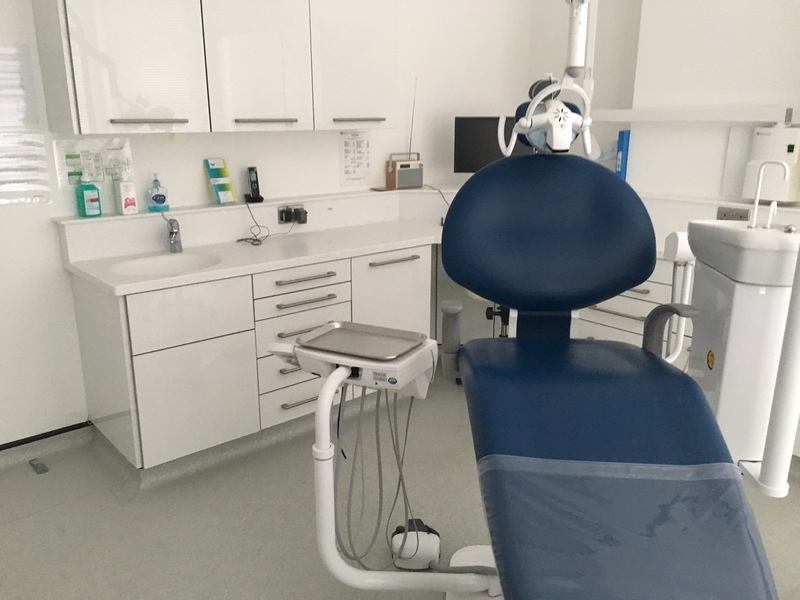 A recent commercial project for two dental surgeries in Kent. 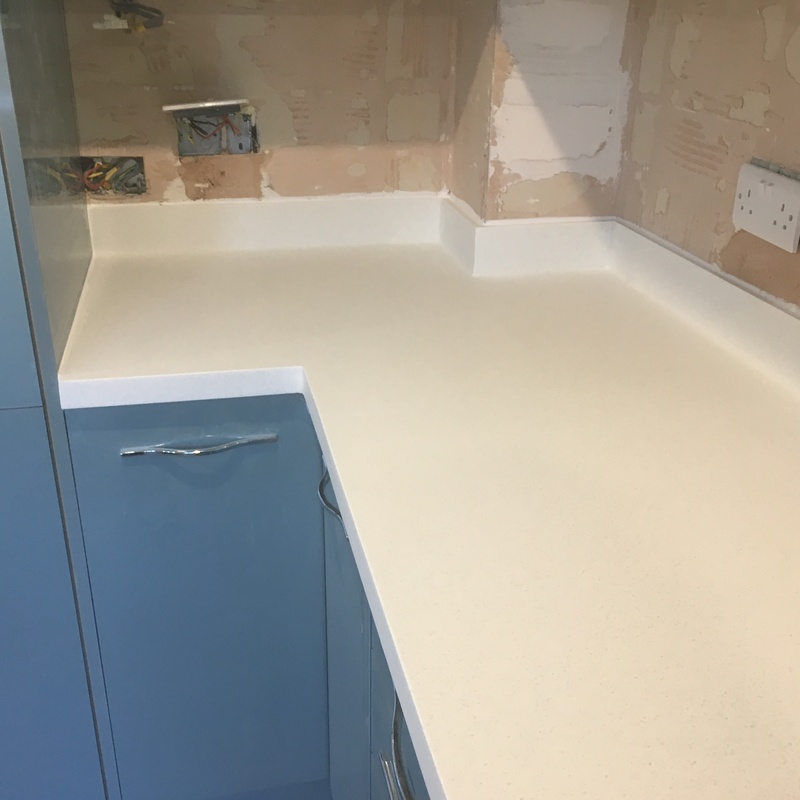 We designed, fabricated and installed new Hanex solid worktops. 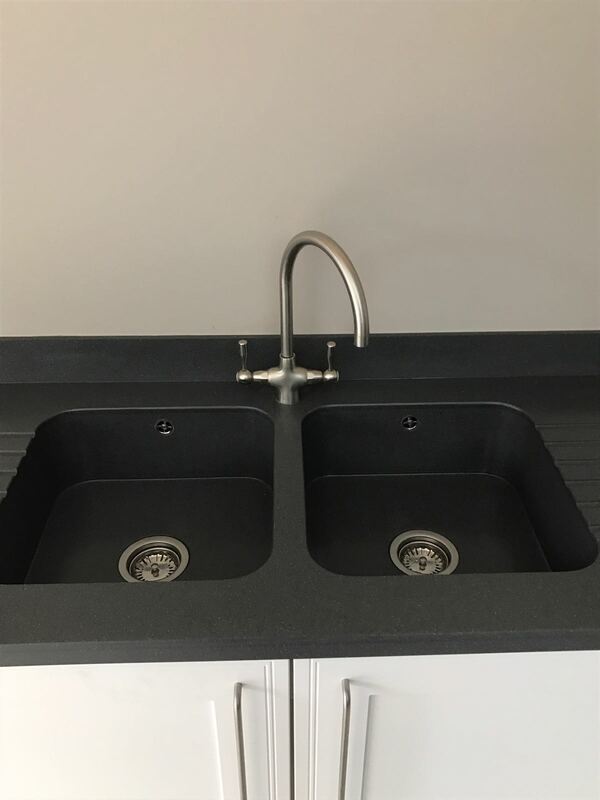 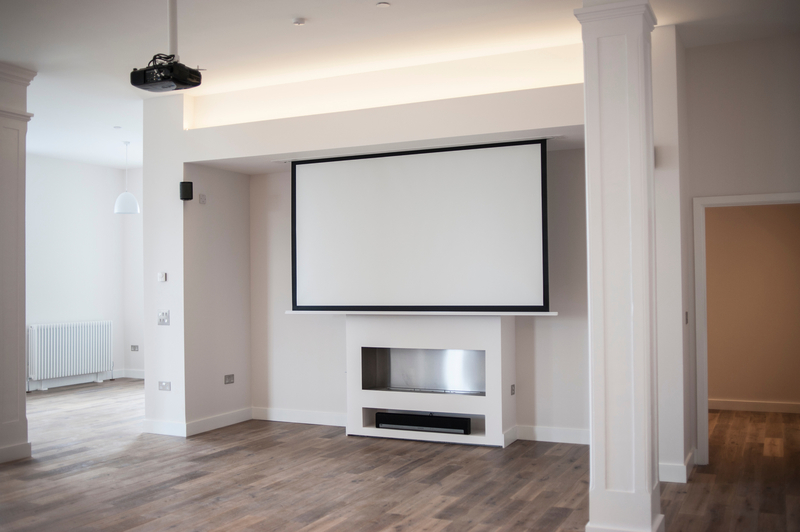 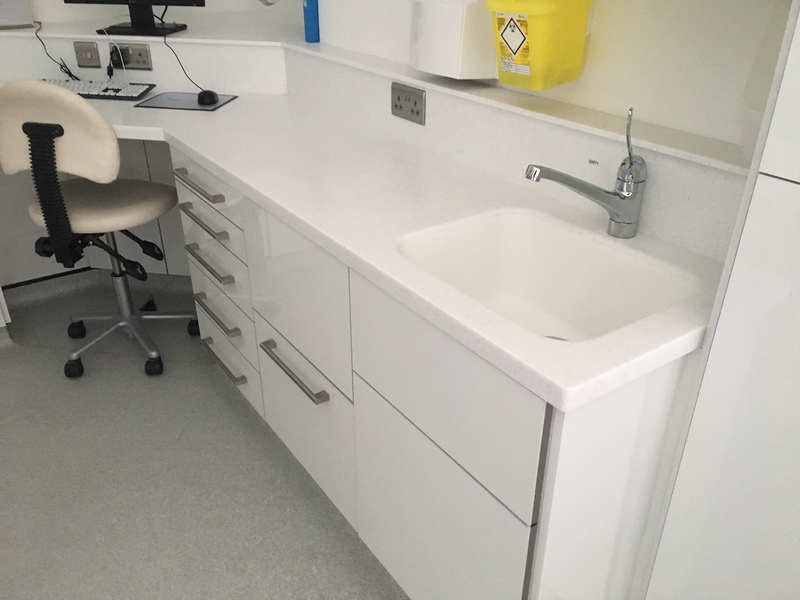 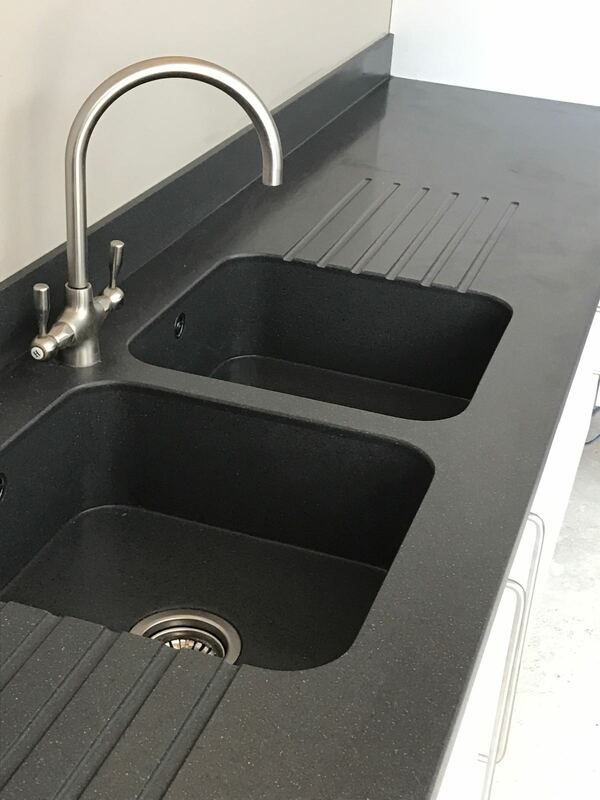 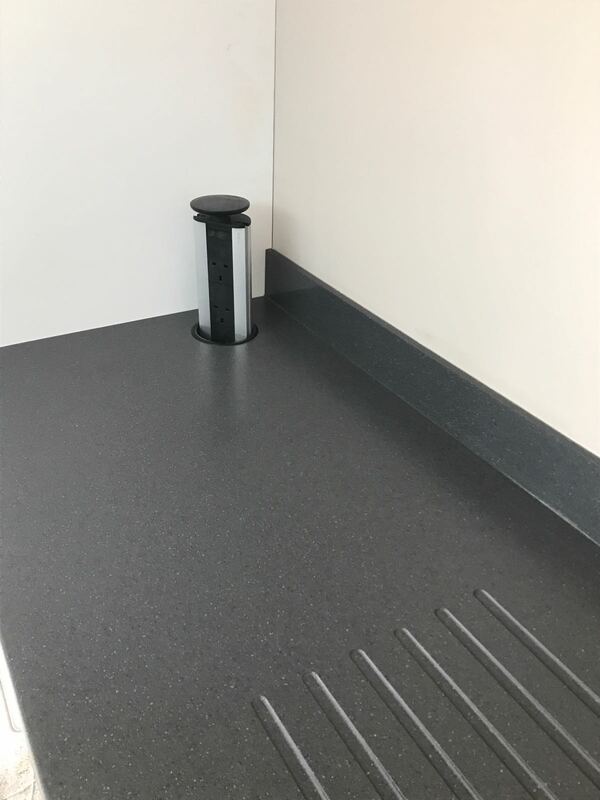 They featured coved upstands with built-in sockets, integrated sinks and a capping on the top to create a shelf for useful storage and further work space. 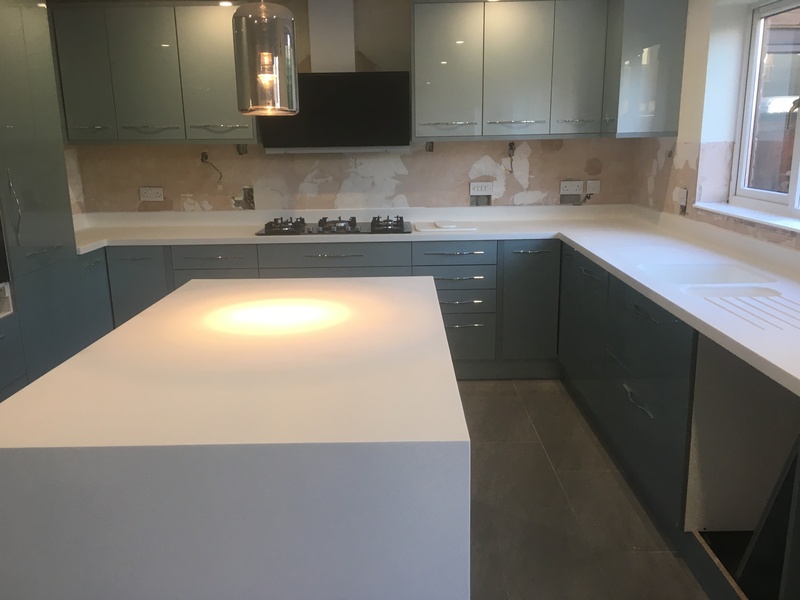 The colour is Ice Queen. 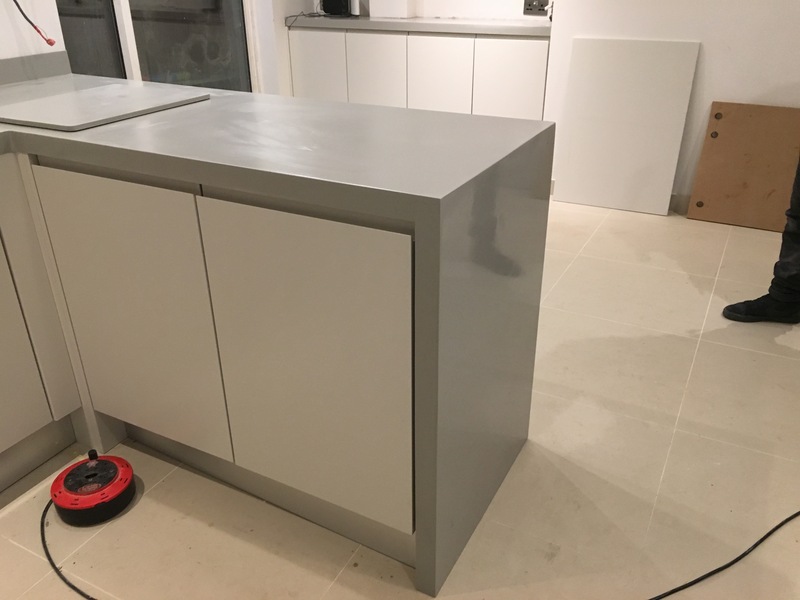 This customer wanted a white worksurface with their matt handless doors. 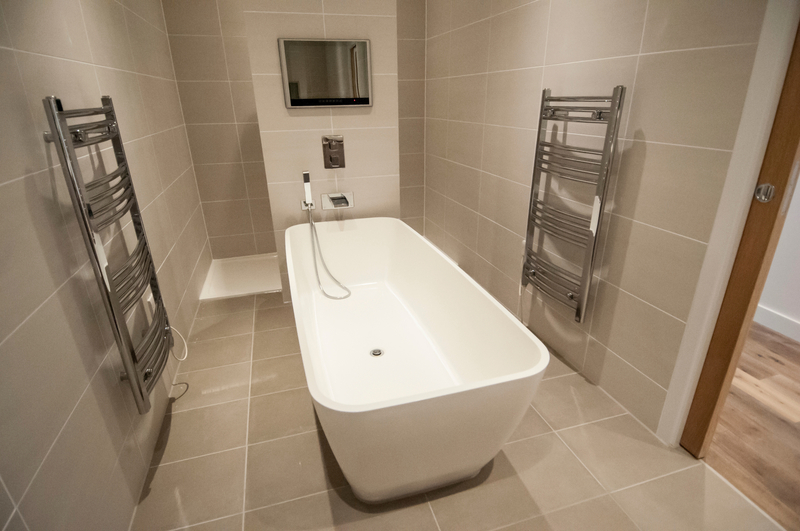 Here is an example of one of our frequent customers in Soho. 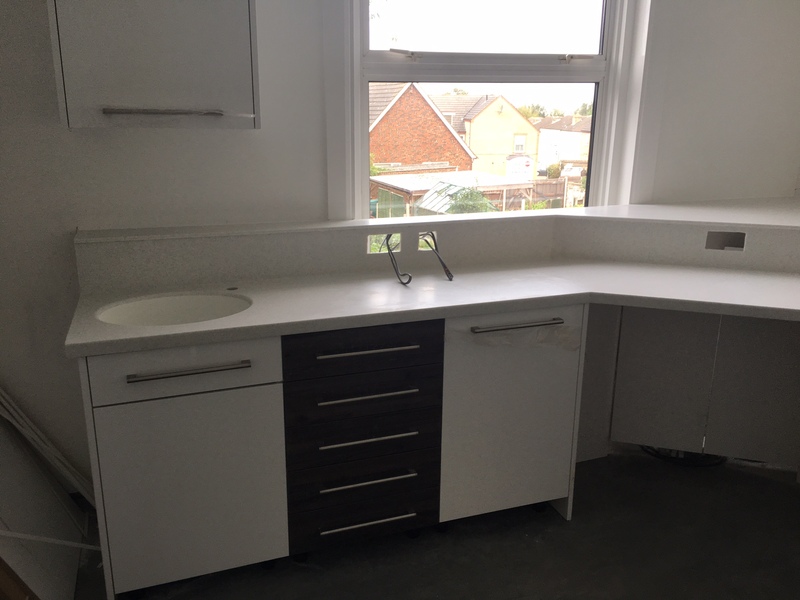 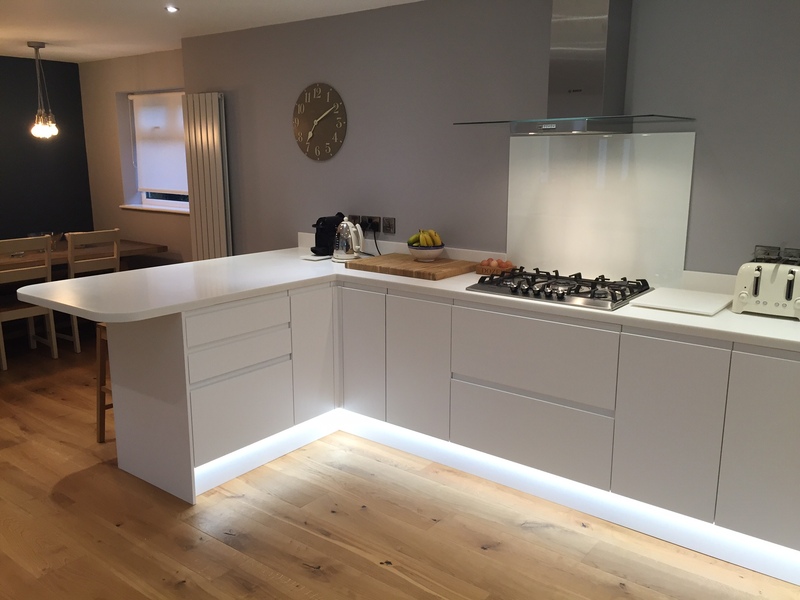 Here is an example of our latest Corian kitchen fitted in Cambridge. 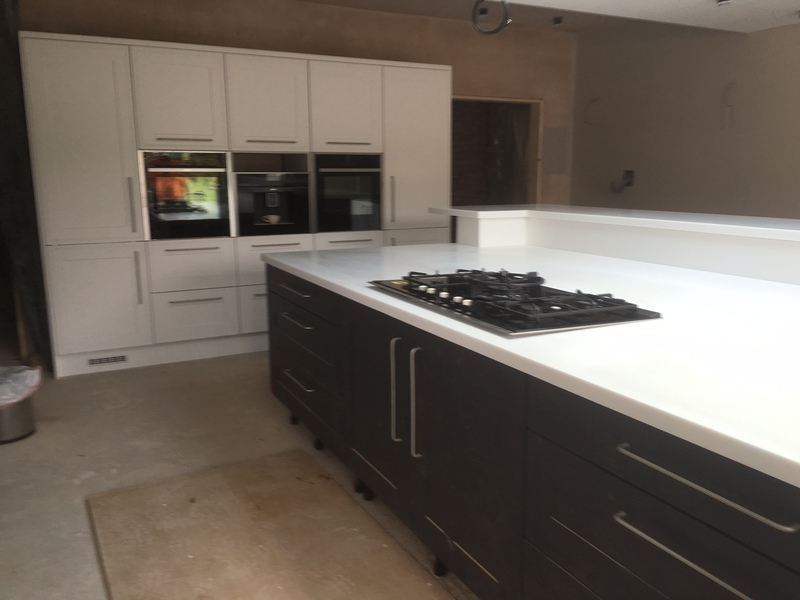 The units were supplied from Howdens joinery and we fabricated them in our factory and fitted them in 2 days.